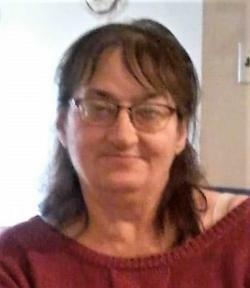 Janet Diane Steeves, 54, of Moncton, passed away on Saturday, April 6, 2019 at the Moncton Hospital. Born July 17, 1964 in Saint John, NB she was the daughter of the late Gilbert and Joyce (Russell) Steeves. Janet graduated from JMA Armstrong High School, and from the NBCC Office Administration and Accounting program as well as the Acadamy of Learning and worked as an accountant and office manager at UPS for many years. She taught, and played the piano, organ and guitar at the former Upper Mountain Road Church, and later the Allison Church. Janet was always involved in her community, and enjoyed the camaraderie she found in being treasurer for the Labatt's pool league, darts league, and ambassador of the woman’s league, to being first on the legion volunteer panel, to many other community fundraiser and outreach/uplift programs. She always believed in enjoying the simple things and living within your means. Janet loved Nascar, her favourite racers being Dale Earnhardt Jr. and Sr. She weekly attended the Petty International Raceway and the Shediac Centre for Speed and was a big supporter of local racers, and even did some racing herself in the powderpuff class. Janet enjoyed sports, and strived to become a figure-skater in her youth before a tail-bone injury. She took part in many girl’s teams, pick-up games, and badminton. She loved being outside minus her allergies and loved rock and country music and anything with a good beat. Janet is survived and sadly missed by her biological mother, Sandra Dowe; her son, Justin (Jamie-Lee) Steeves; grandchildren, Landon, Dakota and Jaxen; sisters, Linda (Marc) and Shelley; brothers, Rob (Sissy) and Matt (Tamara); many nieces and nephews, and special friends, Loni and Gisele. Resting at Salisbury Funeral Home, 3350 Route 106 (372-4800) with visiting Wednesday, April 10 from 6 – 8 pm and from where Funeral Service will be held Thursday, April 11 at 2 pm. If desired, memorials to the Humanity Project or a charity of choice would be appreciated.